But I didn’t quite explain what I meant by Kawaii and Goth/Alternatively Styled. So let’s begin with Pastel Goth! So what are the basic aesthetic elements of “Pastel Goth”? 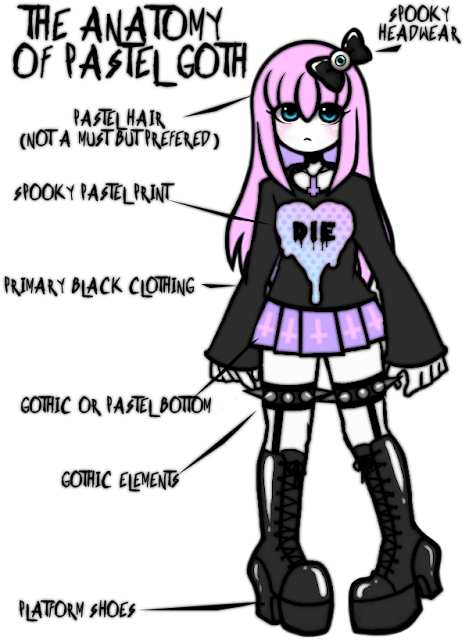 Here is a good reference for Pastel Goth Fashion Anatomy by rabudorimu on Deviant Art. Now let’s move into Menhera Fashion! In the UK: Samaritans (http://www.samaritans.org/) is a registered charity aimed at providing emotional support to anyone in distress or at risk of suicide throughout the United Kingdom. They provide a 24/7, toll-free crisis line, as well as local branches. Samaritans Helpline can be reached at 116 123. In Australia: Lifeline (https://www.lifeline.org.au/) is a 24-hour nationwide service that provides access to crisis support, suicide prevention and mental health support services. It can be reached at 13 11 14. For other countries please see this link (CLICK ME) to find your local helpline/emergency number. You are never alone. Lastly, let’s talk about having a healthy mix of both kawaii and alternative fashions in your life! As with anything in life, a healthy balance/mix I feel is important. And for some people, that means mixing various fashion styles in their life. For me, in my closet I have things that are EGL, Kawaii, Goth, Casual, etc. And I love to mix and match! I don’t think there’s anything wrong with mixing and matching fashion styles, especially because to me, fashion is an art, and art is all about expressing yourself! As I mentioned in my video, I feel like too much “gate-keeping” happens within fashion communities. People are afraid to try new fashions for fear of ridicule by the more experienced in a fashion. 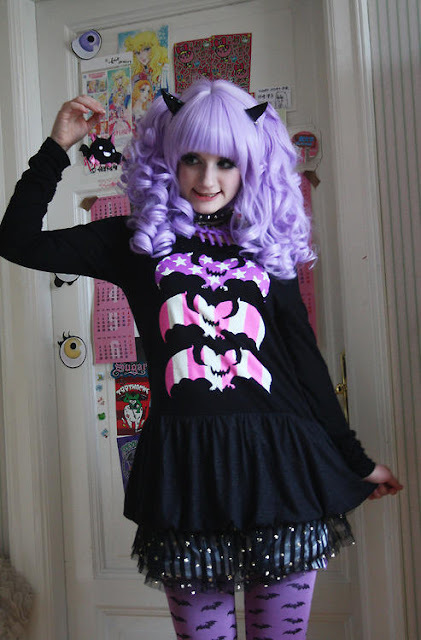 People are afraid to be both Kawaii and Goth, or Goth and Kawaii, whichever way you have it. And that’s terrible! We just can’t live life being afraid to try new things for fear of ridicule. 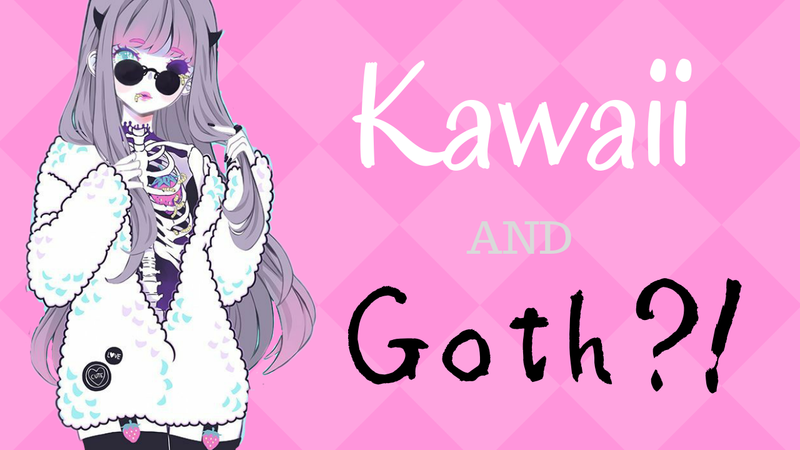 So this post is to say that you CAN be whatever you want, whether that’s Kawaii and Goth, or Steampunk and Menhera, or Punk and Emo, or anything you want to be! That’s the fun of fashion! So remember lovelies, you can be whatever you want. Thanks for reading, and I’ll see you tomorrow! PS- Are you liking this blogging challenge so far? Let me know in the comments if you do!